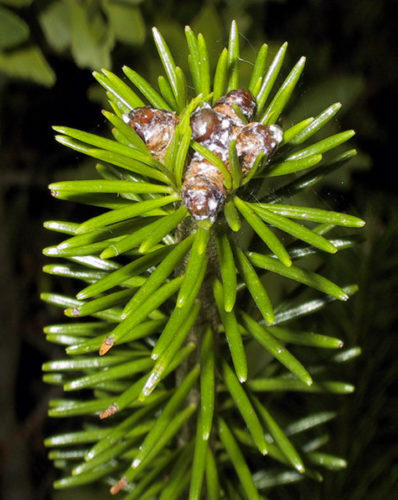 Abies sachallinensis, first described by Friedrich Carl Fedor Bogdanovich Schmidt (1832–1908), and in work completed in 1879 by Maxwell Tylden Masters (1833–1907), is commonly known as Sakhalin fir, also seen spelled, Sachalin fir. The first "discovery" by a European was by Carl Friedrich Schmidt (1811 – 1890), the German botanist on the Russian island of Sakhalin in 1866, but he did not introduce it to Europe. The plant was re-discovered by the English plant-collector, Charles Maries in 1877 near Aomori on the main Japanese island of Honshū, who initially thought it to be a variety of Abies veitchii. A. sachalinensis var. sachalinensis, the type which is described here. A. sachalinensis var. gracilis. See this link for more information. A. sachalinensis var. mayriana. See this link for more information. A. sachalinensis var. nemorensis. See this link for more information. Description. 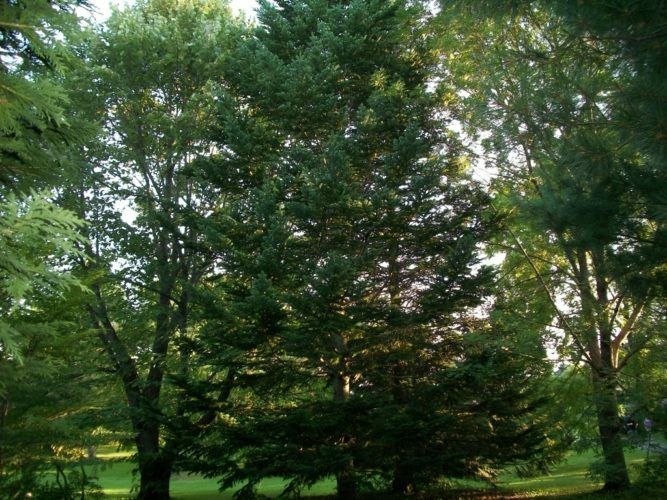 Sakhalin fir is an evergreen coniferous species of tree which grow to heights of 100 feet (30 m), often much shorter in exposed northern parts of its range. 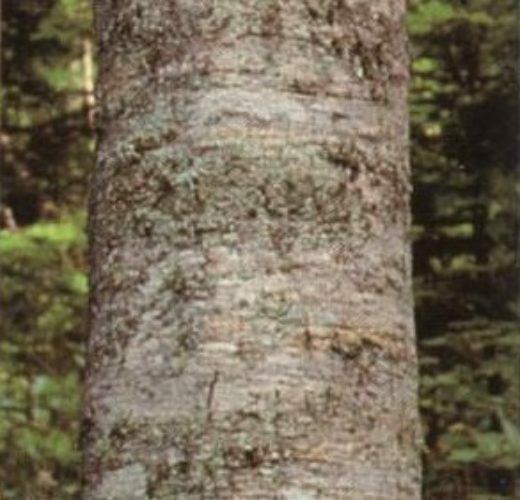 The bark is greyish-white, becoming rough with age. The branchlets are mostly densely pubescent, as are the buds, that can also be resinous. The needles cover the shoots above and the sides and are similar to those of A. veitchii. They are 0.5 to 1.4 inches (1.2 - 3.5 cm) long and 0.04 to 0.05 inch (1 - 1.2 mm) wide, soft in texture and are glossy fresh green above, with 2 narrow greenish white stomatal bands beneath. The seed cones are cylindric, 2 to 3.2 inches (5 - 8 cm) long and 1 to 1.2 inches (2.5 - 3 cm) broad, brown to dark purple when young, maturing to Blue-black to black-brown when mature. The bracts of the seed cones are yellowish to reddish are are hidden by the scales or protrude slightly. Distribution. This species is native to Russia — Sakhalin and Kuril islands; and Japan — Hokkaido island where it grows from sea level to 5,280 (1,650 m) of elevation. It has a preference for moist climates. Abies sachalinensis — a closeup of foliage and buds. Abies sachalinensis — a closeup of bark. 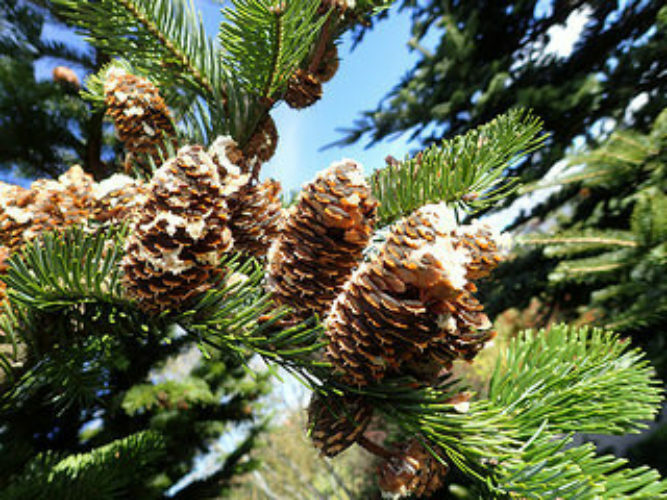 Abies sachalinensis — a closeup of foliage and seed cones.